Marshall, Michigan - A monument commemorates the founding of the Brotherhood of Locomotive Engineers in 1863. The union is now the Brotherhood of Locomotive Engineers and Trainmen, part of the Teamsters Union. 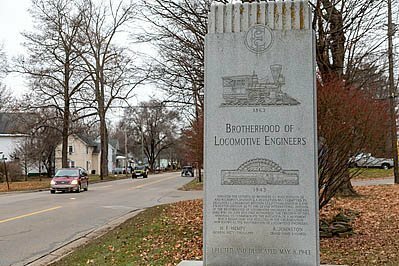 Image Description: Marshall, Michigan - A monument commemorates the founding of the Brotherhood of Locomotive Engineers in 1863. The union is now the Brotherhood of Locomotive Engineers and Trainmen, part of the Teamsters Union.